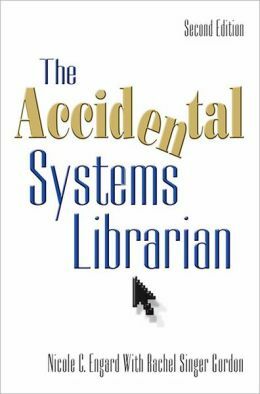 Book Review: The Accidental Systems Librarian, 2nd Ed. One of those ever-famous quotes from library school is that librarians and librarians-in-training must be life-long learners. * The reason for referencing this quote in this review is one of the methods through which Nicole C. Engard gathered anecdotes and examples for her work, The Accidental Systems Librarian, 2nd Edition (TASL) was via a survey sent out to libraries and systems librarians. A general response suggested by many of the respondees was they never expected to be bored. Engard deliberately makes this point 2 or 3 times across the book in varied contexts because one of her main points is systems librarians may go by different titles at their respective institutions, but they are also in charge of teaching staff, teaching patrons, spending a chunk of their scheduled time at the reference desk or some other task in “traditional” library services and keeping current on all kinds of tech services – a task which shows every sign of continual exponential change. Engard’s goal is to explain the types of issues that may fall under the description for Systems Librarian and also the real work/learning load associated with the position. TASL is divided in two major sections: The first four chapters, titled Systems Librarianship 101 – 104, are followed by 8 chapters with specific titles focused on subtasks and the granularity of higher level involvement and projects. I would suggest one justification for this structure is a quote by Eric Morgan in his penned Forward, “Working with technology is as much about collection development as it is about knowing how to use computers” (xvi). Technology in libraries is not about adding more “stuff” for staff and patrons to learn – though more learning is hopefully the inevitable result. Technology is built into more facets of library work and library services because it reflects the types of resources that are in current use and in demand by patrons. As a pathway to being involved in culture, learning about whatever topic, or checking e-mail, networked systems of all kinds must be maintained in order to make that pathway easier to traverse. Hardware, web applications and other e-formats are simply used in tandem with resources such as magazines, newspapers and books. Engard makes clear, however, throughout the book the need for constant education. Not simply personally in efforts for life-long learning. This notion we have already mentioned and will be touched upon once more below. Rather, education designed to bring all staff in-line with expectations held by patrons. In other words, many patrons need help with various aspects of devices, software and some hardware. Many libraries (or library systems), including the one at which I currently work, schedule technology classes in order to teach patrons skills as diverse as how to use subscribed databases for genealogy, how to navigate their e-readers to use the library’s e-collections and how they might use social media to collect ideas for new reading interests. And there are so many others Engard details in the book. The point is it takes educated staff members, confident with these same technological resources in the library’s collections/services arsenal to assist patrons. Also, when a patron comes to ask a question, it is okay for the librarian and the patron to learn something together. But, honestly, the staff member should be the “expert” up to a point and Engard suggests it’s up the systems librarian to collaborate with the rest of the staff and make sure this is the case. How the local Systems Librarian works and what he or she accomplishes is partly up to her and how distributed the technological work load is in the librarian’s respective setting. There are no set tasks declared in the book. There is not an absolute description of what A Systems Librarian is supposed to do because needs vary so greatly. And in this, Nicole C. Engard’s book, The Accidental Systems Librarian, 2nd Edition, has its greatest strength. Sure it lists a ton of web, journal and book resources to learn network troubleshooting, research techniques and modes of instruction. But it emphasizes life-long learning as the mode of interaction across technological “borders,” changes and constant problem solving which fine-tunes that learning. *This is a phrase I come back to pseudo-regularly as I find it of high value to my own motivations. PS: A copy of my review has also been published at LibraryThing. This entry was posted in collection development, internet, knowledge organization, librarianship, libraries, library, library collections, library design, networking, reference books, reference works, social media, Technology in Libraries.